"Take a book; Return a book" is the simple motto of the Little Free Library organization. 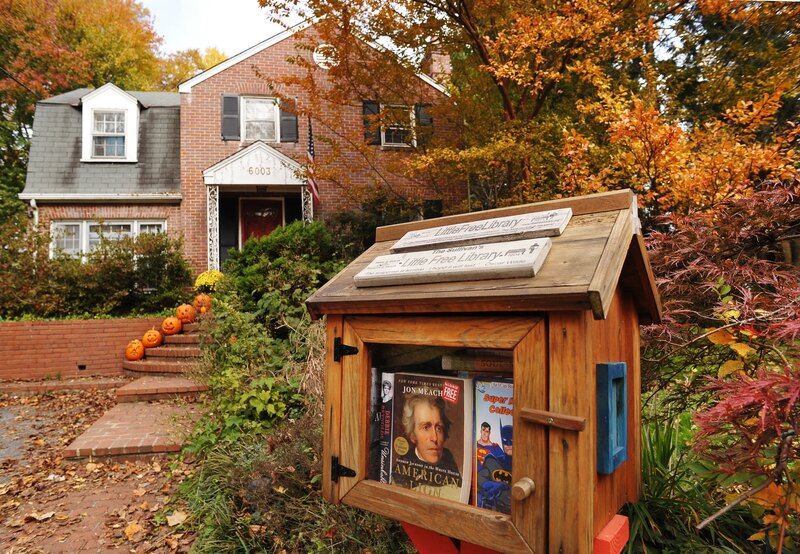 At its most basic level, a little free library is a box full of books that people can borrow from, as if they would from any local public library, though no library cards are necessary. But these mini libraries are so much more than that; they are community-building spots where neighbors can add books they've read and borrow other book recommendations from people in their neighborhood. When you return a book, you can bring back the one you borrowed or a completely new one from your own personal bookshelf. The Little Free Library organization began in 2009, but it's picking up steam across the country and the whole world. Six years ago, Tod Bol of Wisconsin built the first little free library. It looked like a one-room schoolhouse, dedicated to his teacher mother, and he put his favorite books inside, stuck a "Free Books" sign on it, and placed it in his front yard. Today, communities across the globe are taking inspiration from their own hometowns and local icons to build their own "birdhouse-looking" little free libraries. And local designers, craftsmen, architects, and artists are helping their little free libraries stand out as destinations in the community — and you'll have to take a look for yourself to see how incredible they are. You might need a treasure map to find this adorable, camouflaged little library. Dear Greece, Why do you have the most awesome little library ideas ever? Weird, this is the exact image in my head when I picture perfect, cozy Americana. Shout-out to my husband's homeland of New Brunswick, Canada for this stunning free little library. Could they make all my furniture? But seriously, what goes better on a beach trip than a great book? See, Long Beach knows what's up, too. I can sidestep the little "T.S. Lewis" whoops because this is just flat-out killer and I need to have a sculpture like this in my home. Exactly how did this little free library get the best real estate in the entire universe? I want to fall over at how adorable this mushroom is. Book nerds and Dr. Who nerds unite! Dad's meanwhile looking for the escape hatch. I'm obsessed with how this Savannah little library looks as if it's sprouting out from the garden. All libraries will look like this in the future. Surprise free library along your walk to work. Excuse me for using this turn of phrase but I. Can't. Even. This little library in Massachusetts is an homage to a June 2011 tornado that tore through the small town, a tragedy that local historical society said bound the community together. I one day hope to own a home half as beautiful as this little free library. And the old becomes new again. Um, just don't light it. I just decided that a dog park, like this one in Toronto, is the most genius place ever for a little library. Somebody's excited about his local little free library. I wonder if this library is only stocked with Gone Girl, Divergent, This is Where I Leave You, and other books that have been turned into movies. I really appreciate this library's commitment to miniaturization of the regular-sized home. To build your own little free library, just follow the directions on the organization's website. Let your imagination run wild, because the only guideline is to make it official with a charter sign.